Aries January 2016 monthly horoscope forecasts that the main focus this month will be on your profession and accomplishment of your personal objectives. This is because majority of the planets are in the Northern sector of your natal chart. Family and relationships take a backseat during the month for the Aries zodiac sign. Arians should be patient during the month and face insecurities and ambiguities in life with a strong hand. The Aries January 2016 predictions foretell that this is the best time to plan your future career goals which can be executed in the coming months. The 2016 January monthly forecasts for the Ram predict that the planetary positions are favorable throughout the month. This ensures that you make remarkable progress in your career and job. The 2016 horoscope also foretells that planet Venus is not favorably disposed during January 2016. All major financial commitments should be postponed as your monetary acumen will not be that powerful during the month. Arians may come across an opportunity during the third week which requires proper scrutiny. Social connections will help you in accomplishing your money goals during the first half of the month while colleagues and family will assist you during the second half of the month of January 2016. The January 2016 Aries horoscope predicts that nothing much happens in your love life during the month. Important decisions regarding marriage or terminating marriage should be postponed. Present relationships may face turbulence. Assess the situation and make necessary course corrections to keep the relationship on track. Singles will be able to forge new relationships for fun and enjoyment. Be non-committal about permanent relationships during the month of January 2016. Love matches are to be found in your professional life. You look forward to further your professional prospects through these engagements. The January 2016 love predictions for Arians suggests that you will get many chances to mingle with influential and socially prominent people, but do not be in a hurry to get into permanent relationships. This month is not opportune for taking decisions as they may go awry because of negative planetary influences. 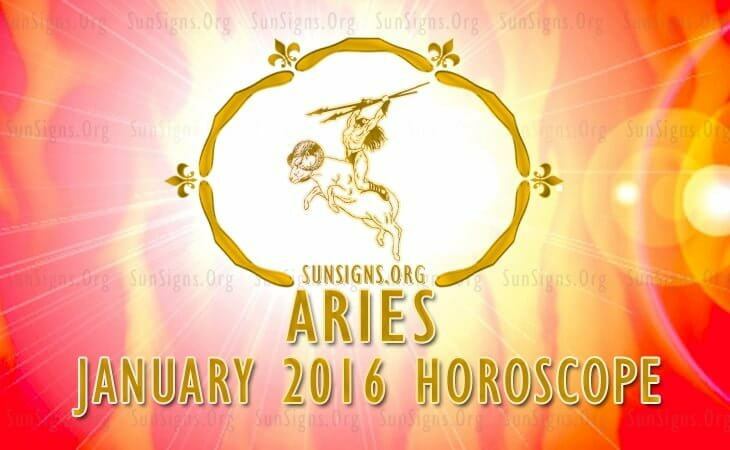 Family relationships with spouse and others will be volatile for the Aries in January 2016. You require enough mental strength to handle the emotional outbursts. Overall this is not a good month to get pregnant as it may lead to issues in the future. Aries, you should take things lightly regarding physical endurance till the third week of January 2016 and concentrate on relaxing your muscular system. Overall, the monthly January 2016 horoscope for Aries predicts a successful career but matters dealing with relationships should be postponed.